Twenty Nisei veterans were recognized. Front row, from left: Shizuo Kondo, Shig Imai, Leke Nakashimada, Hakuzo Nitta, Jim Onchi, Larry Saito, Noboru Takashima, Ike Iwasaki, Art Iwasaki, Kazumi Oda. Back row, from left: Eisaku “Ace” Hiromura, Lorry Nakatsu, Kenji Yaguchi, Ben Soejima, Joe Onchi, Mark Namba, Sam Naito, Jimmie Mizuta, Shigeo Kuroye, Tex Irinaga. 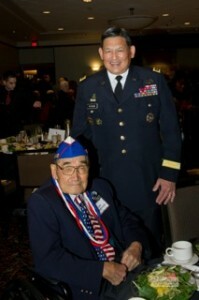 442nd veteran Leke Nakashimada with Lt. Gen. Joseph Peterson. PORTLAND — A Congressional Gold Medal tribute luncheon for veterans of the 100th Infantry Battalion, 442nd Regimental Combat Team and Military Intelligence Service was held Feb. 26 at the Multnomah Athletic Club in Portland with more than 450 people in attendance. 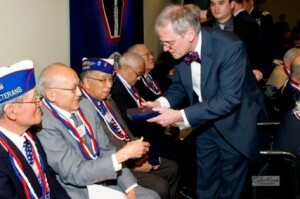 The Congressional Gold Medal was presented to the three Nisei units of World War II last November in Washington, D.C., and regional celebrations are being held across the country for those who were unable to attend. The Portland event was organized by the Oregon Nikkei Endowment and Oregon Nisei Veterans Inc., with Lynn Fuchigami Longfellow chairing the committee. Major sponsors included Portland JACL, Delta Airlines, and the Samuel T. and Mary K. Naito Foundation. Kyle Iboshi of KGW NewsChannel 8 served as emcee. The Adjutant General’s Select Honor Guard presented the colors, Nola Bogle sang the national anthem, and Rev. Robin Yim gave the invocation. A recorded greeting from Sen. Ron Wyden (D-Ore.) was shown. The keynote speaker was Lt. Gen. Joseph R. Peterson, deputy commanding general of the U.S. Army Forces Command (retired). Peterson, who is of Japanese, Chinese and Hawaiian ancestry, also participated in the Washington, D.C. ceremonies. Rep. Earl Blumenauer presented the Congressional Gold Medal replicas. Setsy Larouche, commander of Oregon Nisei Veterans, saluted the World War II vets, an a tribute video was introduced by Wesley Campbell, grandson of MIS veteran Bill Naito. Bronze replicas of the CGM were presented to 20 veterans and family members of deceased vets by Rep. Earl Blumenauer (D-Ore.) and Gen. Peterson, assisted by Cpl. Craig Leedham, grandson of 442nd veteran Kay Akiyama, and Chloe Longfellow, granddaughter of MIS veteran Walter Fuchigami. Ron Iwasaki donated seedlings for each family to take home and plant in honor of the veterans.